My latest internet activity consists of being totally enveloped in Pinterest. It is so easy to spend hours perusing through the myriad of pictures on that site, and always finding something new, and exciting. Each package of won ton wraps contains at least 48 pieces of these paper thin wraps. 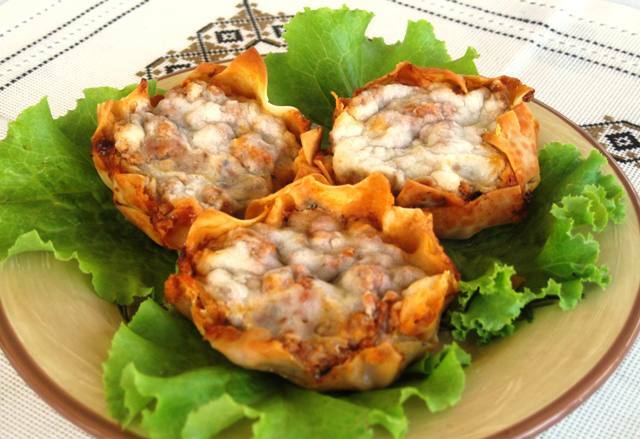 One package has enough wraps to make some Potstickers, plus some of these Lasagna cups, and still have some leftover for a possible dessert idea. I tried storing these wraps the fridge for later use, but after a while they begin to change color to slightly grayish, and start to dry out. I understand you can freeze them, but I rather used them up within a weeks time, and be done with it. Today I will share a recipe for Lasagna in a Wonton cup, which I spotted on Pinterest, and pinned it on my board of Party Foods. I modified the original recipe, to better fit my taste, since I was making these for my grandchildren. This recipe yields 24 cups. Grease, or spray with cooking spray, the cups of 2 cupcake pans. Place one wonton wrap in each cup, gently pressing it down to fit to the bottom of each cup. Set aside. Pour 1 Tbs. of oil into a medium frying pan, warm it up, and place the ground meat in it. Saute the meat at least 5 minutes, mixing it frequently, to break it up and to cook it so it is no longer pink. Scoop out any accumulated fat, and discard. Add salt, pepper, garlic powder, onion powder, dried basil and oregano, and cook 1 minute longer. Add the ricotta cheese, Parmesan cheese, and tomato sauce, and cook another minute. Scoop 2 Tbs. of meat mixture into each wonton cup. Sprinkle some Mozzarella cheese over the top of each cup. Bake lasagna cups for 15 minutes, or until cheese melts and wraps are lightly golden. Remove and serve warm, or cool off completely and store covered in the fridge for later use. You can also wrap them well, and freeze for a future quick dinner or an appetizer. If you prefer, you can saute fresh onions and garlic, and use fresh herbs. Thanks for this .. super idea..
Great picture! I can attest to the fact that these are very, very yummy! Wow, what a wonderful idea for the lasagna recipe. Looking forward to making it next weekend. Thank you sweetie. All I keep on thinking about is your upcoming trip. Have a safe one. These are great for dinner, snack, or party appetizer.